March has certainly come in like a lion – snowstorms are hitting the Northeast left and right and people are wondering the same thing – didn’t the groundhog call for an early spring? Weather like this makes it hard not to scroll wistfully through social media feeds sighing at pictures of beautiful beach sunsets and tropical places. I guess patience is a virtue and while we’re waiting for spring to come, we may as well start prepping our wardrobes in anticipation. Besides the sun and warm weather – yay! – I’m excited for many of the SS’19 trends. This season we’re going to be seeing a lot of 60’s inspired colors and early 90’s textures. It makes an interesting combination and is going to help make this spring fun for fashion – and especially footwear. Of course, as with everything, fashion is cyclical. None of these trends are tremendously groundbreaking and in some cases are recycled from runway collections past. This is awesome for your wallet – because your local Goodwill® stores will likely have many of these trends sitting on their racks. While you’re shopping at Goodwill for the new season, it’s a great reminder that you are contributing to a more sustainable world and helping people in your community find jobs and get the financial assistance they need. When it comes to colors of the upcoming season, think bright and bold. You can accessorize any outfit with a bold shoe. Colors of the season will range from a fiesty neon pink to a cool neon green. My favorite color within this range is a vibrant blue, which has been in and out of style for the past few years – making it easier to thrift items of this color! If you watched the Oscars this year, you may have noticed that thin, strappy sandals are back in style. Though they may not always be the most comfortable, they are stylish and can have a slimming effect on your feet. This style shoe – for both heels and flats – have been popular on and off the last few years so you shouldn’t have much trouble finding a great second-hand pair and your local Goodwill. Somewhat ironically, especially when you think of the current state of the environment, plastic detailing and embellishments are becoming en vogue this spring. A short hop away from jellied textured shoes, this trend is bringing everything from plastic straps to plastic heels to even an entirely plastic boot to the shelves. Bonus points for the brands that are combining the neon trend and coloring their plastics on the shoes. I’m predicting this trend will be a bit short lived (and uncomfortable, not all plastics are flexible!) so by the time summer hits, there should be a great selection to thrift from. In contrast to the plastic trend, silky textures and satin ribbon straps and ankle scarves are in style – and your feet will be incredibly happy! Mixed with pretty colors and interesting shoe shapes, this is one trend that’s here to stay throughout the season and even into fall. No longer exclusive to runway brands, this season fast-fashion brands have already started molding the shape of the heels of their shoes into interesting shapes and textures. Wooden heels with geometric detailing will be in style this spring and we’ll continue to see beautiful detailing in both narrow and block heels throughout the summer. 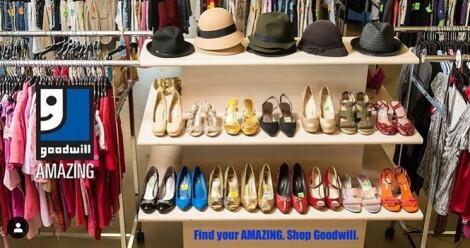 If you search through your local Goodwill stores, there’s a good chance you’ll find some shoes in this trend. I just found a pair of gorgeous brand new Taryn Rose platform block heels for $14.99, and at regular retail price they cost upwards of $250!